One of my best friends who is from Thailand is responsible for this post. She first told me about this a few months ago as she was doing some research into making a natural shampoo as part of her Thai traditional medicine course. Soapnuts are fruits from a shrub that grows in parts of Asia and the Americas. Alternative names include soapberry and sapindus. The fruits are dried and then boiled to release a natural detergent for washing (Ind. Eng. Chem.,pp712-713, 1939). The detergent is used not just for washing hair but also even more 'serious' tasks such as laundry. Q: Really can you just boil a dry fruit and get shampoo? For those of you who read my oat and bean water shampoo article, this will not come as a surprise to you. 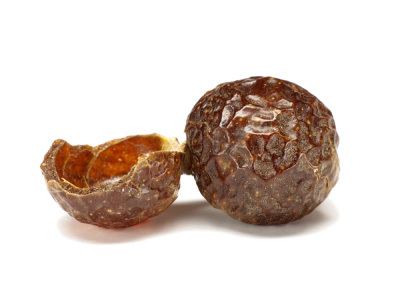 Soapnuts naturally contain a chemical known as saponin (sounds a bit like soap!). Saponins are detergent like in behaviour because they are amphiphilic. Amphiphilic means that on a single molecule you have both a part that is attracted to water and a part that is attracted to oil. Why is this important? It all boils down to the fact that oil and water do not mix, and in order for oil to be removed (i.e cleansing to occur), you need a molecule that can attach to oil and at the same time force it to mix with water so that it can be rinsed off. Therefore you need both a water loving and oil loving part on the same molecule. If you are a visual learner, here is an old diagram, showing you how SLS behaves, the process with saponins would be similar in principle except of course that saponins from soapnuts are a little larger and can be extracted by you boiling the dry fruit. 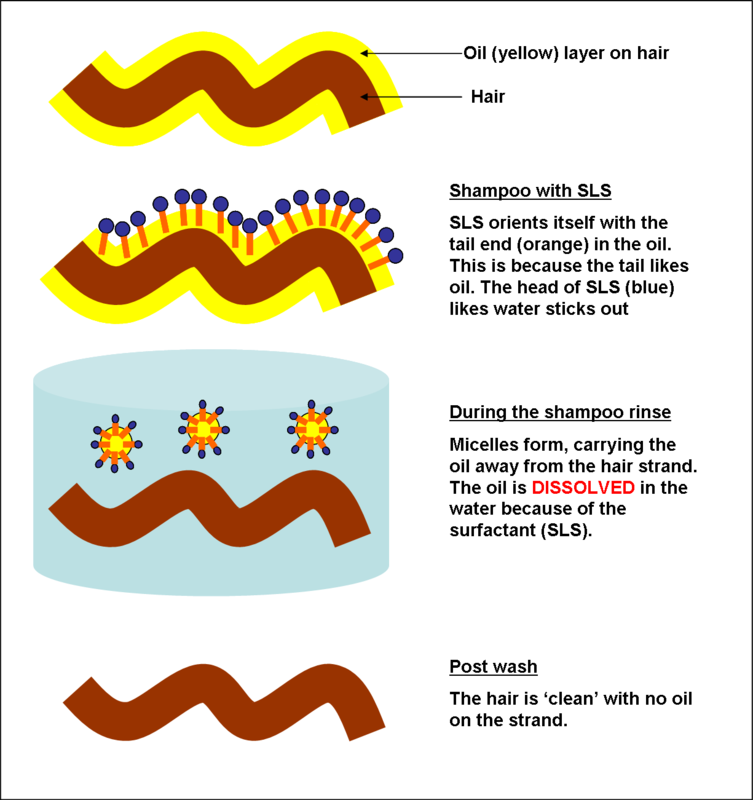 (If you want more details, read how surfactants work in full - here). Q: What is the pH of the soapnut shampoo water? I have not done any experiments myself but I have seen some commercially extracted saponin with a pH of around 4-5when dissolved in water. Q: Ok, so you really are saying we can boil some dry fruit and use that water to wash you hair? I am indeed, here is a helpful video guide! Have you heard of or have you used soapnuts? What is your experience, does it clean well? Have you done a pH test? I've never even heard of soapnuts before, that's really cool. I wonder how this DIY shampoo would compare over time with a traditional shampoo that usually also contains some sort of conditioning agent? And might using the soapnut shampoo improve the performance of your conditioner as it is only cleansing and leaving the conditioner to do the conditioning? Very interesting as always, thanks Jc! I've heard of soapnuts. I'm going to experiment with using them as laundry via EcoNuts Organic Laundry Soap. I thought about it too - Might try it for both laundry and shampoo. I use them when I make a shampoo out of them theyre great. Could you check how cleansing it is to the hair? I love soap nuts! I have tried virtually every natural cleaning method known to man and they have all failed for me (either way too harsh or don't clean at all), until I got to soap nuts. It gives me the perfect balance of clean but not too dry. It's also given me good shine and brought out my curls a bit more. Chemically speaking, soap nuts should be gentler than shampoo. It is a nonionic surfactant, and thus won't denature proteins and isn't as powerful of a surfactant as, say, SLS or shampoo bars. But that said, some people do find it pretty strong, so they can try a more diluted mix, or try shikakai, which is another natural nonionic surfactant that is less powerful (it wasn't strong enough for me personally though). A tip for making the nut shells last longer for more batches: try soaking overnight. I boil some water, pour it over 4 or 5 soap nuts like I'm making tea, cover it, and then go to bed. Shampoo is ready in the morning! I find that more of the rind stays intact when you do this, whereas it tends to get broken down by boiling. A friend of mine told me about Soapnuts quite a while ago. She loves it and uses it for many things, for example: shampoo, laundry, dishes, cleaner around the house, etc. I will be trying it in the near future. Where can we find the post on oatmeal and bean water? I still have a whole box of them left, so if anyone can give me advice on how to use them to get the scalp clean, I wouldn't mind trying again. I found that I had to "scritch" in order to get them to clean. I have a little squirter bottle, and put some on the front and top, each side, part like I'm making pig tails and put some there on the back of my hair, scritching a bit for each section. This works better for me than letting it sit, even for a long period of time. And I can rinse it right out when I'm done scritchin', just like I would with shampoo. Basically, the liquid seems to work better when agitated than left to set. Responding to Ihu. Sapindus Trifoliatus (Aritha), soapnuts, is included along with alma and shikakai extracts in Keracare Natural Textures Cleansing Cream. I've been using it for over a year - it cleans my scalp very well, does not leave any residue build-up. Actually, it's the only cleanser (of many) that I've used that doesn't cause itchiness after usage and seems to control what I suspect is Malassezia overgrowth (benefit of the ingredient, neem extract that is also included?). I cover my head with a plastic cap after massaging it in and leave it on my scalp for about 30 mins prior to rinsing. Unfortunately, soapnuts give me hives. I never found out how well they might clean my hair. This is a great article, I love the detail about the Amphiphilic molecule, science is awesome!